It’s getting harder and harder for Chambers of Commerce to get noticed on social media. 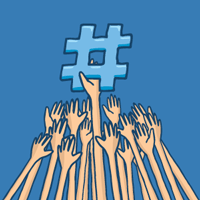 A simple way to get some traction and maximize visibility is to use hashtags. Social media has made the hashtag a ubiquitous part of Internet culture, starting with Twitter and expanding to other sites. Originally designed for categorizing posts, the hashtag can now be a tool for a supplementary coy or witty comment (e.g., #awkward). 1. (on social media websites) a word or phrase preceded by a hashmark (#), used within a message to identify a keyword or topic of interest and facilitate a search for it. Remember you can keep an eye on trending hashtags and share posts that are relevant and appropriate to your Chamber. Important: Save yourself the agony of a social media mishap. Always clarify hashtag meanings. They evolve and may not mean what they used to or what you think they mean. Check out ChamberMaster’s Social Media Survival Infographic for 30 quick and easy ideas for social media posts.